New student orientation and learning assistance coordinator Dulcemaria Anaya and School of Social Sciences, Humanities and Arts graduate specialist Karla Seijas were recognized as 2019 Latina Women of the Year at a luncheon earlier this month. 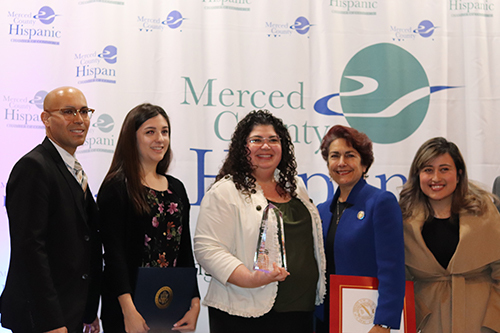 The Merced County Hispanic Chamber of Commerce hosted the event recognizing three women for their work in the community. Anaya has been active in multiple areas outside her position in the Calvin E. Bright Success Center. She has served as chapter chair of the UC Merced Alumni Campus Employees Chapter since 2015 and leads engagement projects such as participation in the Boys and Girls Club’s annual Trunk or Treat event. Anaya, who graduated from the university in 2011, served on the UC Merced Alumni Association Board of Directors and worked on the United Way campaign at UC Merced. Most recently, Anaya and a colleague received a Diversity, Equity and Inclusion grant to create a language-accessibility committee at UC Merced. This project provides a series of professional development workshops for bilingual staff members who would like to practice learning university terminology in Spanish. Dulcemaria Anaya was honored at the Latina Women of the Year luncheon earlier this month. Photo courtesy of the Merced County Hispanic Chamber of Commerce. Seijas — who has been with the university since 2016 — grew up in Merced and returned to the city following her husband’s retirement from the Army. After years of working in politics — Seijas ran for the District 4 seat on Merced City Council in November — she turned her attention to advocating for service members and their families. Last year, while serving as chair of the Merced Veterans Memorial Building Association, Seijas advocated for an increase in the annual amount budgeted for maintenance to all Merced county veterans’ halls. The Merced County Board of Supervisors voted in favor of Seijas and allocated $1.5 million — the previous amount was $20,000 — for 2018-2019. Seijas is also the founder of Boots in Action, an organization that connects veterans with each other to build friendships and camaraderie. Outside of veteran related activities, Seijas represents the city of Merced for the Measure V Oversight Committee and is a member of Merced Sunrise Rotary, American Legion Auxiliary, Mothers of Preschoolers and League of Women Voters. Karla Seijas was honored at the Latina Women of the Year luncheon earlier this month. 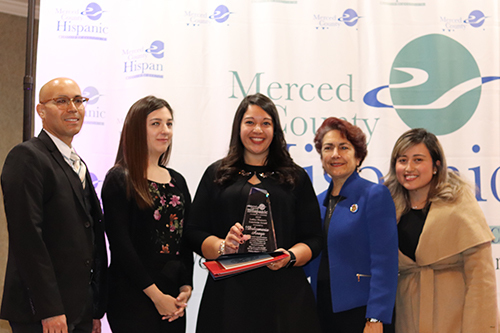 Photo courtesy of the Merced County Hispanic Chamber of Commerce.